The hour-long training is bystander CPR/AED training (not a full CPR certification training program), designed to help participants understand the signs of Sudden Cardiac Arrest and respond accordingly. The free training will feature interactive practice of “hands-only” CPR with a mannequin so individuals can understand how to properly perform chest compressions. The class will also demonstrate how simple it is to use an AED (Automated External Defibrillator), which has simple instructions built into it so users can push one button then listen to the robot’s instructions. Hospital leaders introduced the Illinois Heart Rescue Project at a recent community leader meeting where leaders responded with support and interest. Hospital staff is now working to set up training sessions with more than 40 local schools, faith communities and other neighborhood organizations. And new organizations are invited to schedule a free training session. The Swedish Covenant Hospital Foundation is underwriting the cost of the program, which will be conducted by CPR-certified hospital staff while visiting partner locations. The training can also take place at the hospital if preferred. 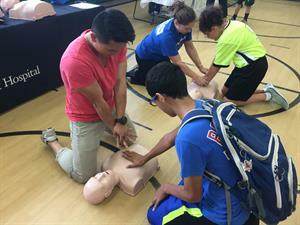 To schedule a CPR training session, community groups can contact Maggie Simmons of the Swedish Covenant Hospital Emergency Department Education Team at masimmons@SwedishCovenant.org or 773-878-8200, ext. 6837.